Double-faced wool: hard to find, luscious, durable— and if ever a fabric earned the accolade timeless, this is it. Double-faced is a weaving technique that creates two layers on the same fabric; it is not a lining. The faces may be different colours or not; the textile is almost indescribably lush and warm, but not super-heavy if the layers are light. (The same technique also creates unctuous double-faced silk.) Because of its weight, it is now more often found in menswear, and usually results in higher-priced garments because of both the quantity of material required and the more complex weaving technique. If the retail prices are scary, snoop for it in vintage shops; they really don't make much of this anymore. 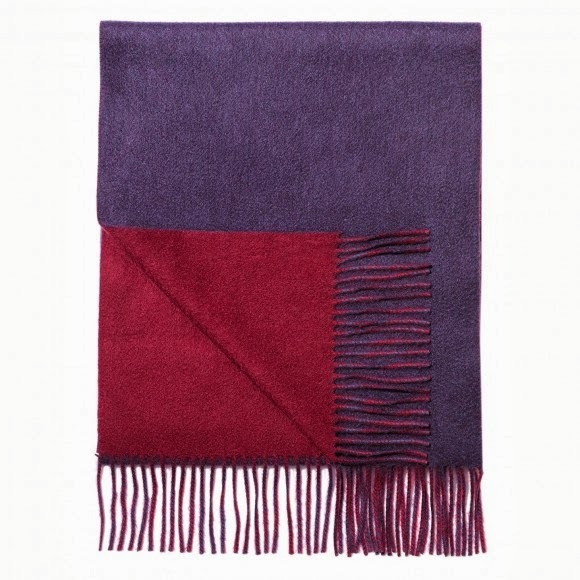 Two-colour scarf of double-faced cashmere, from Eric Bompard. Shown, galaxy Purple/Plum Pink, €117. Sold as a man's accessory, but fabulous on a woman, like a man's watch. I snatched one from Le Duc: burgundy reversing to flame orange. An elegant coat, well-priced for the fabric. 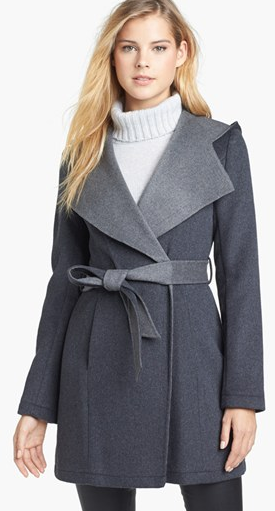 Laundry double-faced wool wrap coat, $250 at Nordstrom (international shipping). J. Crew are onto double faced as part of their retro-luxe Collection line. 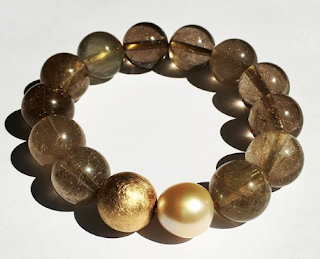 This piece is strato-priced but I predict will go deeply on sale, as a grand ($995) for a cashmere tee seems crazy. Watch for it drop and think, maybe. Very chic with a shirt under, rolled to the elbow, but you can do that with any knit tee. 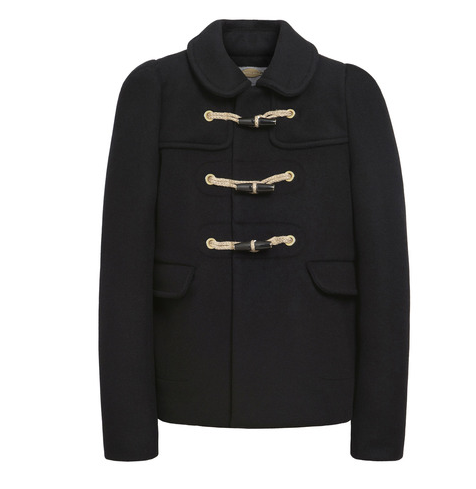 Mulberry have designed an absolutely impeccable black double-faced duffle jacket, one of my all-time dream garments, with genuine horn buttons; if you keep the moths away, it would outlive you. Price, $1, 650 at Mulberry. At a much lower price point: Talbots. Someone there still channels the days when they carried fabrics from Italian mills. This long wool jacket could work; the fabric is promising (wool with a touch of nylon) and unlike most double-faces, it's offered in colours like teal, iris and the marigold shown (as well as the neutrals). A classic dresser could pick this up with accessories; very Beene-ish. Price, $269. 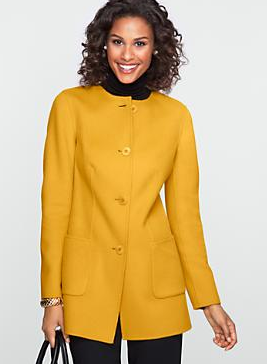 They also make a shorter jacket in ten colours and, though crazed by their wildly uneven quality and sizing, I applaud that they offer the jackets in misses, petite, woman's and woman's petite sizes. Seek these fabrics for their satisfying substance, but pick something you love, as their durability is remarkable. And if you already have a double-faced piece, take your treasure for yet another ramble, as the leaves turn. I have a new double faced coat for winter. It is a black and white plaid on one side and a black tweed on the other. So yes, it is reversible! Did I need another coat in Dallas, TX? No. I barely get to wear the ones I have due to our very mild weather during the winter months. BUT, the double faced reversible wool coat was too wonderful to pass up. I have a few other double faced wool items as well--all jackets or coats. One is over ten year old now. It has some sewn on metal trim that I am going to remove this year as an update measure. Then, it will be good as new. I would shy away from J Crew cashmere. 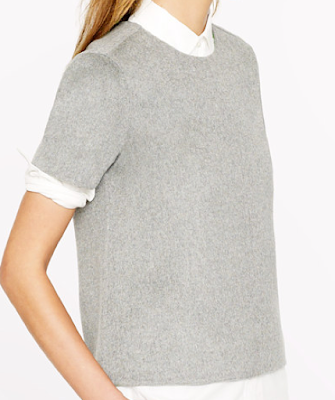 I have never seen cashmere pill so completely and so quickly as cashmere from J Crew. OT - The Nobel Prize in Literature for canadian writer Alice Munro. Love Bompard's double face scarfs. I just bought some beautiful double-faced coating in anticipation of moving east. It's navy and gray and gorgeous! I probably won't sew it until we get to wherever we decide to land, but I couldn't pass up the chance to buy it. One of my favorite fabrics...but--ooh--moths are so scary. I have a double-faced wool coat - grey on the outside, camel on the inside - and it's the perfect weight for fall and spring. I think it's about 20 years old now and I still wear it, so I've definitely gotten my money's worth from it. Those who sew can watch Marcy Tilton's site as well as Emma One Sock's. Both have double-faced wool now and then. Hmm, probably Mood Fabrics and Elliot Berman do as well. Talbots sells nice double faced wool skirts and such. The one thing to keep in mind is that it's difficult to alter clothes made with this fabric. My seamstress gave me a lesson in that little known fact when I took in a skirt that was too big. She ended up adding seaming detailing to it. French cashmere (generally milled in China but to their specs) is somewhere between the two. We have bought many pieces from Eric Bompard, for example, over the years, and the pill factor really varies. I am writing this wearing a J. Crew cable v-neck cashmere that must be 10 years old. I just wash it and that takes care of 85% of the pills; the rest I gently pull off. Susan: Sounds beautiful. Perhaps you will get rid of one of the other coats? Barbara: I KNOW!!! Isn't that the best? Sewing Librarian: Will be fun to hear what you do decide to make! frugal: Any fine wool needs to be stored conscientiously. I am free of moths in this condo but battled them for decades in my old house. MJ: Perfect example of its endurance. Lucky you! Jean S.: Thanks for the sources; it is hard to find but worth the hunt. Anonymous: Did you notice that the last picture, the marigold coat, is from Talbot's? Alerting double-faced wool is not for the faint of heart; the layers must be separated, and conventional seaming techiques can result in ugly bubbled seams. In better garments, seams are frequently finished by hand. Just as I thought I'd managed to resist the Bompard delights (for this week, at least -- the catalogue arrived in the mail!). . . .you temptress! This is a sumptuous fabric indeed. I suspect the current craze may have been started by Raf Simons camel and pink double-faced wool coat, in his final collection for Jil Sander. 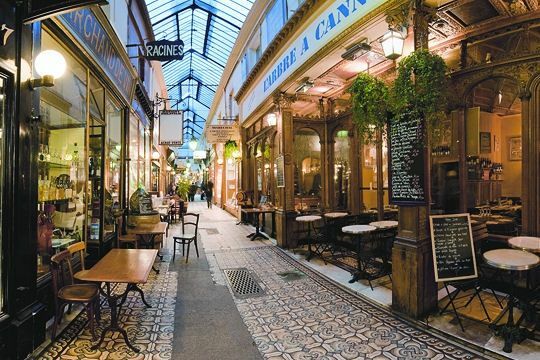 To my way of thinking, this kind of thing is real luxury. I loved this fabric when I came across it, but isn't it often stiff? (obviously not the lovely scarf). The cashmere tee is not only absurdly expensive, it is also weirdly asexual. I don't like all the hypersexualized garments in vogue now, in some circles, but that thing erases body shape. I find the pretty grey coat a bit stiff as well. lagatta: There is a difference between substantial and stiff. I have never seen a stiff doublefaced wool; perhaps you have? Aha, I didn't know there was a regional difference in cashmere milling. I will say that the cashmere cardi I bought from J Crew a few years ago was lovely but only for one wearing, after which it became shabby and no amount of washing or shaving would get rid of the allover pills enough to restore it to my standards. In fact, that was a bit of a last straw for J Crew and the expensive-and-shoddy clothing I had ordered on their entree into Canada. We had to break up after that. Dorky (if I may use your first name): I don't ever shave my cashmere or use a stone. These tools are too hard on the fiber. I have not bought J. Crew cashmere for at least 6 yrs. I like Brora very much- wears like iron- but also buy a lot of EB for the colours and styles. Someone at work was wearing a gorgeous deep plum cardigan, I asked where it was from, she said Brora - I looked it up and winced over the prices. The only cashmere I've sprung to is M & S and that on special at the end of the season. No matter what you say about 'cost per wear' I'm not sure I can bring myself to spend that much on knitwear. birdybegins: Brora is first=quality cashmere. 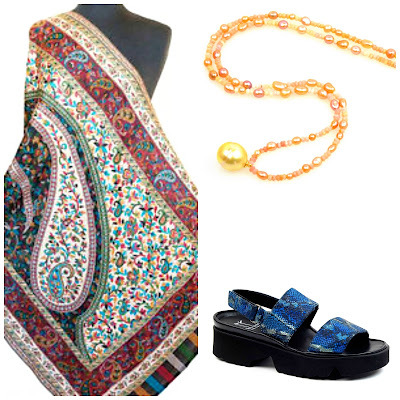 They wear very well and the colours are subtle and unsual. (They look more one-dimensional on the site.) Labour is done is Scotland, not China, if that makes a difference to you. The post-Christmas sales and occasional promotions reduce the price but not all styles and colours end up on sale.